Design occupies an important place in the modern world, and European legislatures have made many attempts, both technical and legal, to protect works of design. The proposals by the European Community for a Directive and Regulation in this area are a response to the widely perceived need for a homogeneous and systematic protection of designs. These initiatives, however, should be considered in light of the many interests at stake and the various solutions proposed in the wake of the Community's past experience in the field of patents and trademarks. 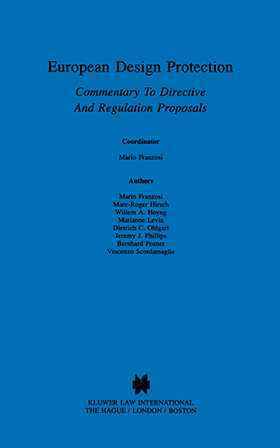 This Commentary presents both an analysis of the complete texts of the proposals in their `historical' context through annotation of the preparatory stages in the legislative process, as well as an in-depth interpretation of the provisions, seen through the eyes of some of the leading experts in the field. The strength of the publication lies in the fact that the different nationalities of the contributors mirror the approach adopted by the Community in drawing on a range of national design legislation to shape the European design protection system. The contributors' long and varied experience is drawn together here to given an original and unique guide to the new legislation.